To become an accomplished walleye angler, the first steps are to understand the walleyes behavior and seasonal movements in order to shorten the learning curve of where the walleyes will be. Take into consideration all factors, including type of water, weather conditions, time of year, water temperature, wind speed and direction, and time of day. Then choose the appropriate presentation suited to the habitat of feeding walleyes. This is the process of developing a pattern, if the presentation you choose is not working but your marking fish on your graph or LCD try something different versus moving to another spot. Usually subtle changes in the presentation will make a big difference, suggestions such as down sizing minnows or switching from a minnow to a leech, or a slip bobber versus a jig and minnow, which allows the bait to hang in the feeding zone, can change your success. The topics listed below will help you understand many of the situations you may encounter when fishing for the elusive walleye. Most all Northern States and Canadian inland waters are closed for the walleye spawning season with the exception of some rivers systems while Southern States are open continuously. During this period fishing for walleyes can be the best or worst with the critical factor being the weather. Stable weather for a few days with any increase in water temperature, even a degree or two, can trigger active walleyes to bite. But if a cold front moves in dropping the water temperature this will have the opposite effect and shut down the bite. If you’re walleye fishing during the spring season your best bet is in the afternoon when the water temperature is at the highest point for the day. In the early period of the spawn walleyes will stage off spawning areas in deeper water (15 feet plus), and because of the cold temperatures will not be aggressively feeding. You can still catch them by using slow vertical presentations such as jig and minnow or a vibrating blade lure, the key again is very slow and vertical. Later in the spawning period they will move more actively towards the shallow gravel areas, if the water is muddy or dark they can be in water as shallow as 2-3 feet even during the day. For very shallow water try using a 1/32 oz jig tipped with a small fathead minnow or a number 5 floating Rapala. For best results these presentations should be twitched or retrieved slowly. During the pre-spawn and spawn your will catch will be mostly all small males, the big females will not bite once they start to spawn but all of them do not spawn at once. Those that have not started to spawn can still be caught, but as the spawing period progresses fishing for females is a waste of time. However, females that have spawned early will recover and begin to feed. Each body of water or river system has different spawning cycles, stream based walleye spawn first then shoreline and finally shallow reef walleyes spawn last. Knowing this will allow early season walleye anglers to move to different areas or a new lake where the timing of the spawn has not occurred, completed or is in the process. The spawning migration of walleye begins soon after the ice goes out, at water temperatures of 38-44ºF, ordinarily peaking when water temperatures reach 42-50ºF. Normally when you think of fishing for walleye it’s associated with deep water, rock piles and humps that walleyes prefer with hard clean bottom structure. But the few anglers that fish weeds for walleyes know how much time walleyes spend in and around the edges of weed beds. Walleye will move into the weeds seeking baitfish that use the protection of cover. They also use weeds for shade and cooler temperatures instead of deeper water. The best weeds are submergent broadleaf types such as cabbage next to or in deeper water, than emergent (cattails, bulrushes) or floating (lily pads) that live in very shallow water. You can catch walleye in weeds almost any time of the year but weed fishing is best during the summer and into fall once the weeds are established. Fishing for walleye along the weed edge is easy, use a slip sinker rig with a weedless hook or a weedless jig tipped with a minnow, leech or a piece of night crawler keeping it as close as possible to the weed edge. But when walleyes are actually in the weeds or suspended above, use a slip bobber rig or weedless jig in 1/16 to 1/8 oz by twitching it through the weeds. Other tactics are 1/8 oz spinner baits cast into weed pockets and allowing it to helicopter down before retrieving, if the weeds don’t grow to the surface try a shallow running crank bait twitching the lure just above the weed tops. Most wildlife artists that paint walleye portraits will have them displayed over rocks and boulders. The main reason being this one the best places to consistently find walleyes, it is also one of the most difficult lake bottoms to fish especially when using live bait rigs or jigs. Here are some suggestions to catch more walleyes when you find that hot rock pile, mid lake hump, or rocky point. Deep diving floating crank baits, select a crank bait that will run just off the bottom or bump the rocks, if the lure should get hung up let the line go limp, it should float up. Use a floating jig head, for night crawlers inject a shot of air from a crawler inflator, For slip sinker weights try a No Snagg tube weight instead of a egg or walking sinker. Keep your line as vertical as possible, by adding weight to this set-up you reduce the angle of your line and therefore reduce your chances to get hung up. In many man-made flowages and rivers, drowned wood and brush are the main dominate cover that walleyes rely on as a food source and shade from the sun. You will find scattered walleye around almost any type of submerged timber, stumps, logs, and trees that have eroded from shorelines. To increase your chances on finding a walleye hotspot of drowned wood and brush here’s a tip, deep water. The best wood is in or near deep water. A tree toppled off a steep river bank leading into deep water will hold more walleye than one laying in shallow water. Find a stump field flat next to an old river bed on a flowage and you’ll find a walleye magnet. During early spring when the winter thaw occurs and high water floods rivers and flowages try shoreline brush and lay downs as this will harbor small baitfish and insects that walleyes feed on. As the water begins to drop walleye will move back to deeper water. This is a natural reaction to avoid being trapped in isolated pools on river systems. Drowned wood, lay downs and brush plies composed of fir, pine, oak and maple typically last for years. By contrast birch, aspen and popple provide cover for two to three years before decomposing. Drowned wood is terrific cover. The more complex branches are below the surface the better fishing. More branches equal more cover for a game fish to ambush prey. Finding “good” drowned wood means finding walleye. Finesse fishing in wood and brush requires fine wire weedless hooks (size 6-8) on a split shot rig, brush guard jigs from 1/16 to 1/8 oz., both tipped with live bait. These presentations will increase your hooking percentage and eliminate snags. When fishing deep water timber/stumps try a slip bobber rig. Don’t be afraid to drop your bait into the thickest tangle of brush and logs, the larger walleyes are usually found where the cover is densest, you may lose a few rigs in the process but the rewards are well worth it. Locating and catching suspended walleye can be a difficult task. Finding suspended walleyes requires the use of a graph or LCD (liquid crystal display) depth finder. Once fish are located you must present the bait or lure precisely at that depth. For inland waters one of the easiest techniques to do this is a slip bobber rig set at the depth walleyes are found. If walleyes are a few feet from the bottom rather than lowering the bait try floating the bait up off the bottom using a slip sinker rig with a floating jig head or a float attached to the leader. You can also catch walleyes off the bottom by jigging vertically with jigs, blade baits and tail spin jigs, just keep the line taut to feel the strikes. On large bodies of water such as the Great Lakes the most effective and popular presentation for suspended walleyes is trolling with artificial lures. Great Lakes charter captains use numerous tools to achieve the proper depth and presentation in catching suspended walleyes. Click on each to learn more Lead Core Line, Downriggers, Diving Planes, Planer Boards. (Note to Bob Place links to each above from Learning how to fish) Another technique is casting a weight forward spinner tipped with a crawler counted down to the proper depth, this is primarily used on Lake Erie. Water Temperature: In deep clear lakes walleyes will seek deeper water after feeding to avoid sunlight. On stained lakes they often move more laterally than deeper if the water temperature stratifies into layers. By moving laterally they will maintain in the same temperature layer. Walleyes that feed on reefs will suspend off the reef to rest, not to feed. Walleyes are typically known to relate to the bottom for feeding, this is especially true when they feed on immature insects, particularly mayfly nymphs that hatch on the bottom. But other favorite forage do not necessarily relate to the bottom such as open water baitfish like shad and ciscoes that can be found almost at any depth. At times walleyes will be opportunistic feeders by ignoring their temperature and oxygen preferences for an easy meal by suspending in open water just below baitfish schools that dimple the surface. During the summer on lakes that stratify, the deep water may lack sufficient oxygen which forces the walleyes to suspend or use shallow water cover such as weed beds. In many cases walleyes will suspend to avoid high levels of toxic gases that accumulate near the bottom. This happens during the summer months on calm sunny days when the maximum amount of sunlight penetration promotes decomposition of organic bottom sediments releasing carbon dioxide and methane gas. This moves walleyes higher in the water column, as much as up to 10 feet. On windy days when the water is churning this prevents the gases to accumulate so the walleyes need not suspend. It’s no question that the toughest time to catch any species including the walleye is after a cold front. Blue bird skies and cool temperatures follow a fronts passage. This results in the walleye tightly hugging the lake bottom or buried into the weeds. Their feeding window is very limited if at all. When they do feed it will be short. Depending on the cold front severity it may take a number of days of stable weather to resume normal fishing activity. When faced in this situation here are a few tips that may improve your success. Fish very early in the day or in the evening. Cold front walleyes are best active during low light periods or night. Fish deeper during the day: (5-10 ft) than normal as increased sunlight from cold front clear skies will drive walleyes deeper. Walleyes are in lethargic state during a cold front, small live bait will work better than larger ones. Use 2″ fatheads than 4″ red tail chubs. Try a 1/16 oz rather than an 1/8oz tipped with live bait. A lighter jig will drop slower and gives the walleye extra time to strike. Retrieve very slowly. Walleyes will not hit fast moving baits during this period. Attach a stinger hook to the jig: Many times a walleye will just nip the bait and let it go, with a stinger hook you will hook a good percentage of these short striking walleyes. 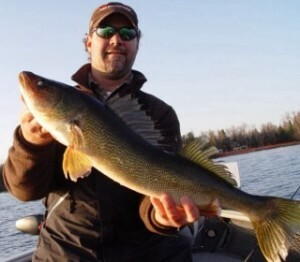 Cold front walleyes are line shy, use 4lb clear monofilament or fluorocarbon. Some walleyes will bury into the weeds rather than seek deeper water. These walleyes will also resume normal activity before the walleyes in deeper water. On shallow water lakes than have murky water stirred by strong north winds that usually come after a cold front, try fishing mid day and shallower. The water temperature is the warmest and the level of sunlight is not a factor due to the water clarity. If you’re fishing a clear water lake with no luck move to a river or stained lake because they are not affected as bad as clear water. Fishing walleyes on clear water lakes (Visibility 10 ft or Greater) is quite the challenge. Walleyes in clear water are easily spooked by sound or movements (boats). On sunny days they will retreat to depths of 30 plus feet only to move up shallow to feed during early morning and evening hours. On windy chop or overcast days they follow the same dawn dusk patterns but some feeding occurs during the day. The best suggestion we can offer you for walleye fishing clear water lakes is to keep your set-up presentation in a stealth mode and again keep noise and boat movement to a minimum. If you’re anchored keep the boat as far away as possible from the targeted structure while casting. For trolling use inline planer boards to spread the fishing lines 50 feet away from the boat. If you’re using a live bait set-up keep the hooks as small as possible and use light line (4lb.) on slip bobbers and slip sinker rigs. Jigs also produce well on clear water lakes but stay with natural colors black, purple and brown. The same goes for artificial lures, match the hatch that resembles the baitfish, black & silver, black & gold, and perch finishes rather than hot fluorescent colors. Long slender bodied minnow type lures will be the best performer. Walleye fishing on stained or dark water tends to be more consistent than on clear water lakes. This type of water is also less affected by weather changes, especially cold fronts. With the lack of sunlight walleyes will stay shallow most of time and are easier to locate and catch. If the visibility is less than one foot try bright and noisy artificial lures which are easier for the walleye to detect. If you prefer live bait add a fluorescent attractor or spinner. The best fishing times on dark water is mid day between 10:00-5:00 rather than dawn and dusk. The night bite is likely to be poor. Sunny clam days will out perform cloudy windy days. The best lures for dark waters are crankbaits that vibrate and have rattle chambers and inline spinners in fluorescent colors. Jigs will also work surprisingly well even through they do not produce any sound. Use fluorescent and glow in the dark (phosphorescent) colors tipped with live bait. On stained lakes with visibility of 3 feet or greater, live bait set-ups are a better choice than artificial lures. Add a brightly colored attractor or spinner to your live bait rigs to help attract fish. With weed growth on dark water and stained lakes being very limited find the weed edges and cast perpendicular to the edge. Shallow reefs and rock humps will also hold fish regularly.